Please join in supporting efforts to serve youth in this community. Our mission is to mobilize and engage all sectors of our communities to work together to reduce risk behaviors of our youth, helping them to reach their full potential in a healthy environment. How would you like to direct your gift? In Honor of Someone: Please include the name of the person you are honoring, and if you would like them to receive notification of this donation, please include their mailing address. Memorial Donation: Please include the name of the person you are memorializing, the name & address of the person who should receive notification of this gift, & any message of condolences. 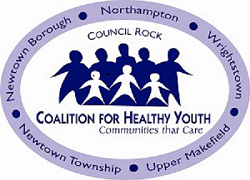 Donate 100% - Add 3% so that 100% of the donation goes to Council Rock Coalition for Healthy Youth. Council Rock Coalition for Healthy Youth has partnered with Network for Good to securely process your online credit card payment via Network for Good (tax ID 68-0480736). This transaction will appear on your credit card statement as "Network for Good." This transaction is subject to Network for Good’s Privacy, Security & Disclosure Statement and the Charitable Solicitation Disclosure.